Christopher Jaroniec received his B.S. degree in Chemistry from Kent State University in 1997 and his Ph.D. in Physical Chemistry from the Massachusetts Institute of Technology in 2003, where he was a National Science Foundation Graduate Research Fellow with Robert Griffin, and he was a Damon Runyon Cancer Research Foundation Postdoctoral Fellow with Ad Bax at the National Institutes of Health. He joined The Ohio State University as an Assistant Professor in 2006, was promoted to Associate Professor in 2011 and Professor in 2014, and named Evans Scholar in 2013. 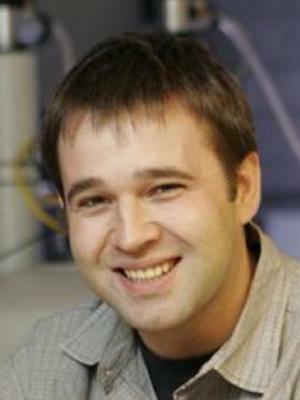 Professor Jaroniec received the CAREER Award from the National Science Foundation, the Eli Lilly Young Investigator Award in Analytical Chemistry, the Camille Dreyfus Teacher-Scholar Award, the Founders' Medal from the International Council on Magnetic Resonance in Biological Systems, and the ACS Physical Division Early-Career Award in Experimental Physical Chemistry, and was elected as Fellow of the American Association for the Advancement of Science. Our work is currently funded by the National Science Foundation, the National Institutes of Health, the Camille & Henry Dreyfus Foundation, Eli Lilly and the Evans Disease Endowment Fund at Ohio State. Dr. Jaroniec will be taking graduate students this year and welcomes inquiries about openings in his group.